Re: Your NUTTY FEDERAL VIOLATIONS! Dt: 05/23/2013 & Everyday, from here on in! This is Zuma Dogg; and yes, of course you know who I am, relating to your 1st Amendment beach issues. Is it TRUE that you need permission of the City Manager to sing, "Star Spangled Banner?" IN WHAT COUNTRY ARE WE NOW LIVING? What if I wanna give a lecture on how ILLEGAL/IN VIOLATION OF U.S. CONSTITUTION THIS INSANE NOTION (THAT IS BEING ENFORCED IN REALITY) IS? : We (The People/Zuma Dogg) will prove that in FEDERAL COURT. And, Mr. Mayor, you give ONE GUY permission (letter) to do what city bans ALL OTHERS from doing at the beach. That ain't fair y'all. Either this letter proves LEGAL FOR ALL; or MAYOR is KINGPIN who allows SOME to break the law, with no police interference. I WANT THAT LETTER, TOO! (Bob, I saw your picture, and just feel you are a nice guy, and if someone "gets" to you, at a public meeting, you are merely trying to be compassionate. BUT, that ain't good enough. ;) Do you know how HURT [emotionally damaged] my feelings would be if you didn't give ME a letter, after you gave one to the other guy? The kinda thing people SUE in FEDERAL COURT over. There is a reason elected bodies VOTE on things; and not just hand out random "stay out of jail, free" letters to people. AND, I don't wanna show up at a public city meeting, during the weekday; and give my name (personal info) to the City, to give a free speech against a City policy, or City Hall issue -- OR TO ASK FOR YOUR PERMISSION TO DO WHAT SOMEONE ELSE CAN DO, RELATING TO CIVIL RIGHTS. AND, appears San Diego does NOT recognize (define, for us) what is protected and what is not. I guess it is up to us all to be legal mind readers of what the City Manager will deem acceptable at their discretion. Kinda creepy. I believe HIGHLY ILLEGAL=in violation of U.S. Constitutional LAW, this country was founded upon. (13) Sale of Merchandise. (A) Except for those sales that are protected by the First Amendment, it is unlawful to sell or offer for sale any goods, wares, merchandise, article, or thing whatsoever [OR ANYTHING WHATSOEVER!!!] without the written consent of the City Manager [WHO IS THE ULTIMATE DECIDER IN THE SKY, WITH TOTAL DISCRETION, IT APPEARS. Better be NICE to that person.] And WHAT ITEMS ARE PROTECTED AND WHAT ITEMS ARE NOT? L.A. City at least defines that (whether one agrees with the definition, or not). Bob, these issues are making me cranky. Here's the L.A. Times 2010 article about what happened LAST time I got cranky, when municipal corporation tried running their own dictatorship on U.S. SOIL. YOU WILL LOSE! Take a look at my picture -- and give the cops one of those letters saying, "DON'T EVEN LOOK AT ZUMA DOGG. SHIELD YOUR EYES. LOOK THE OTHER WAY. DON'T EVEN THINK A THOUGHT ABOUT APPROACHING HIM. HE EVEN SENSES THOSE." 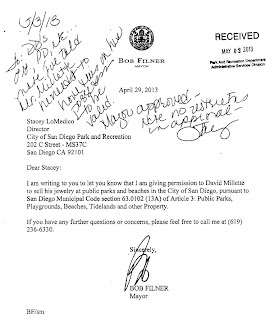 - (What) Mayor Bob Finer (Should Send Cops/Recs&Parks in one of his Willy Wonka "Golden Ticket" letters.) I WILL TAKE YOUR CITY TREASURY IN CITY MONEY SPENT DEFENDING THIS -- ONLY FOR YOU TO LOSE! THERE WILL MANY ON THE SUIT.